The historic landscape area of Bovehill and Landimore roughly equates to the extent of the northern area of the later medieval Manor of Landimore, excluding the settlement at Cheriton and the valley of Burry Pill to the south and the marshland to the north. The area of Bovehill and Llandimore was originally located within the Welsh medieval Cwmwd of Gwyr, within the Cantref of Eginog. During the reorganisation of the post-medieval period the area formed part of the Hundred of Swansea, within the County of Glamorgan. It has been conjectured that during the early medieval period the area formed part of a much larger 'maenor', remnants of this large estate survived in a much-reduced form following dismemberment under Anglo-Norman control. It is thought that Payn de Turbeville inherited this larger Welsh unit, and that this larger holding was broken up as a result of grants to religious orders, so that by the twelfth century the manor retained only the dispersed sub-manors of Rhossili, Landimore and Llanrhidian (Draisey 2002). The surviving area of Landimore itself may represent the territory formerly associated with one of the former maenor's townships. Moreover, it is possible that the boundaries of the later medieval manor of Llandimore may represent the continuity of a fairly ancient land division, especially given the area fell into Anglo-Norman hands through intermarriage with the local Welsh holders of the area, rather than through conquest. 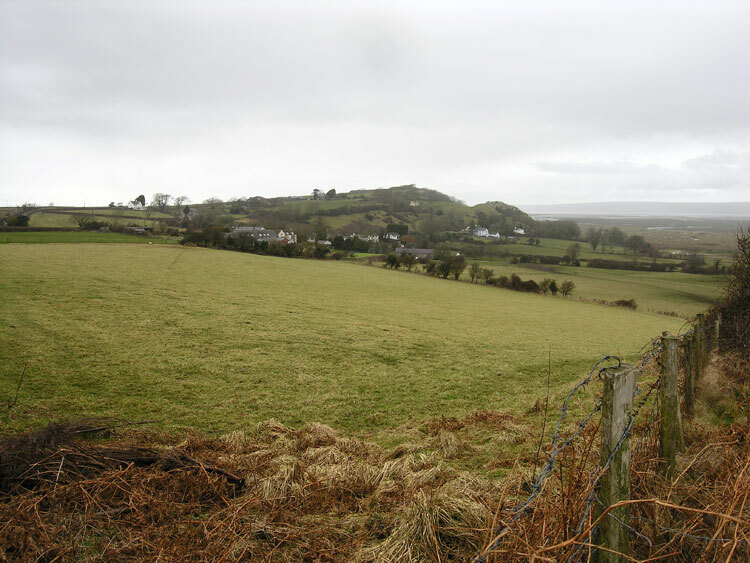 This is perhaps supported by the fact that the boundaries of the later manor and the parish of Cheriton, make a purposeful extension to include the hillfort of the Bulwarks at the eastern end of Llanmadoc Hill, the latter gave the name Llandimore to the area. A church at Llandimore is mentioned in a document called the Confirmation of Bishop Anselm dated AD 1230, but not in the Valor Ecclesiaticus; it is possible that it had been destroyed by then, and it has been conjectured that its existence is confirmed by the holding of the mabsant in the village of Llandimore on 4th February (Davies 1879, 130-3). Traditionally it is supposed to have been near the sea, but there is no supporting evidence (OS card SS 49 SE 7). It is possible that Llandimore and Cheriton may be the same. The early medieval Welsh dedication of the church at Cheriton to Cadoc appears to support an early pre-Norman foundation of the Cheriton site and the place name Landimore would be commensurate with a location close to the major fort of the area, the Bulwarks. It is known that William de Turberville granted the church of Landimore, as well as those at Llanrhidian and Rhossili to the Knights Hospitallers of St John at Slebech in Pembrokeshire sometime between 1135 and 1230. The renaming of the settlement of Landimore to Cheriton ('church town'), apparently in honour of the very fine Early English style church, which still exists (Edith Evans 2003a, 2004), may date to this period and to rebuilding by the Hospitallers. Landimore is thought to have constituted a knight's fee from the early 12th-century, probably administered from an early castle. In 1353 there is mention of a castle in the vill of Landimore, however the site known as Landimore Castle is occupied by the ruins of a late fifteenth century strong house which may be attributable to Sir Hugh Johnys and there is no indication of earlier fortifications occupying the site. It is known from the Liber Niger and Liber Rubeus that William Turbeville held an unidentified knight's fee, the location of which is indicated in his grant of c.1165 to the Knights Hospitaller of churches at Landimore, Llanrhidian and Rhossili. This grant indicated a large holding extending along the north coast of Gower, broadly corresponding with the parishes of Cheriton (formerly Landimore) and the neighbouring parish of Llanrhidian, and a detached property to the south at Rhossili. The Royal Commission suggests that a castle ringwork, North Hill Tor (00093w; 305558), located on a coastal promontory to the northeast of Cheriton, may have served as the Turbeville caput (RCAHMW 2000, 444-448), however, an alternative site for this is the ringwork located at Cil Ifor to the east near Llanrhidian (RCAHMW 1991, 117-9). The de Turbeville family's control of the area was interrupted when Rhys Gryg re-established Welsh control in Gower (1217-1220); until Landimore was restored to the Turbervilles, the area was held by Morgan Gam, lord of Afan. In 1353, the vill of Landymore is described as having a castle and one knight's fee, however there is no indication as the exact location of these. In 1366 the manor of Landimore had been appropriated by the Marcher lord. The Royal Commission conjecture that the present settlement of Landimore, clustered around the later strong house, may represent the site of the 14th-century vill and that the existence of such a vill may have determined the location of the strong house (RCAHMW 2000, 444-448). The lack of any evidence to suggest a previous stronghold on the site does raise the possibility that the present settlement of Landimore and the adjacent fieldscape might represent a reorganisation of the landscape, this appears to be further indicated by the apparent dislocation of the present settlement from the earlier church site, considered to be at Cheriton. The settlement of Landimore needs further detailed research before its historical development can be fully understood. In 1451 the manor was granted to Sir Hugh Johnys, a distinguished soldier and later official to the duke of Norfolk. Tradition holds that Landimore, or Bovehill Castle (00097w; SAM GM149), was built by Sir Hugh Johnys, who is also reputed to have installed lead pipes, which supplied water from a well on the north side of Ryer's Down. The surviving remains at Bovehill are considered compatible with the dating. The early abandonment of Landimore Castle following the death of Sir Hugh Johnys may be explained by the acquisition of the estate by Sir Rhys ap Thomas, the leading supporter of Henry VII. Sir Rhys appears to have concentrated on reorganising Weobley Castle, which he had purchased at the same time, and this to the detriment of Landimore. The fee of Landimore passed to Lady Katherine St. John, the widow of Sir Rhys ap Thomas's son Gruffydd, and on her death in 1553 Landimore reverted to the crown. Anthony Mansel purchased Landimore four years later, and by 1570 the lands were in possession of Henry, Lord Herbert, first earl of Pembroke of the second creation. In 1666 Phillip, the then earl of Pembroke, sold Landimore and the associated Gower manors to Edward Mansel of Margam; a deed indicates that the buildings of Landimore Castle had been long abandoned by this date. Later reference to the Castle, such as Lewis (1833) and Cliffe (1848) chart the progressive decay of the site (RCAHMW 2000, 444-448). Of the settlement around Landimore Castle, little is recorded. The first edition OS 25-inch map shows a settlement layout little different from that which survives to the present. The settlement comprises two parts: the lower, a ribbon development of cottages, including the 'Three Brothers' Public House, along the curving west-east lane, which turns at Townsend, to run north to the marsh. The upper settlement based on the farmstead of Bovehill, is a linear ribbon arrangement of farm buildings and cottages along the upper track leading to the coastal cliff area and the site of Landimore Castle itself. Both settlement areas are effectively divided by a linear area of steeply sloping rough land, which is a continuation of the coastal cliff area (HLCA 014) and characterised by limestone outcropping and quarrying. Also indicated within this area is the former village pound. The farmstead at Townsend is shown as a series of three separate ranges all aligned on a similar alignment, while Landimore farm, set slightly apart from the main settlement comprises a U-shaped arrangement of ranges set around a central yard. The name and location of Townsend farmstead with Landimore farm slightly to the south appears to indicate the extent of the settlement core. The majority of the buildings, which make up the settlement at the time of the survey of the 1st edition OS map are cottages or at best lesser farmsteads, these are typically arranged in ribbon fashion with examples of buildings arranged both parallel and tangentially to the road; all are set within enclosures, some of which are curvilinear intakes enclosed from the aforementioned linear area of steeply sloping rough land. At least two of the cottages are set at the far end of their enclosures, adjacent to the rough area, rather than the lane, these are typically arranged with their long axis down the slope. Aerial photographic evidence shows that the settlement was formerly more extensive with additional small enclosures, hollow ways and possible rectangular structures (02210w) located in the area east of adjacent to Landimore and Townsend farms. The first edition 25-inch map also depicts small linear strips or enclosures within the bounds of the settlement and within the area to the south surviving remnants of sinuous medieval share lands, fossilised strip fields, probably indicating the location of the former medieval open field. To the west of the settlement a pattern of more regular rectangular enclosures, some of which have been amalgamated, extends to the outlying dispersed farmsteads of Broadway, two opposing ranges set across a yard set at a right-angle to the main east west road which traverses the area, and Northhills Farm, set within its holding and then a long irregular linear range with a smaller separate building to the north.